Buhari on Monday poked fun at former VP, Atiku’s defection from the APC party. Atiku defected to PDP last week to fulfill his ambition of becoming the President in 2019. As Buhari walked into the hall he looked towards where Oyegun was and made the remark jocukarly. Many people laughed as Buhari made his way to his seat. 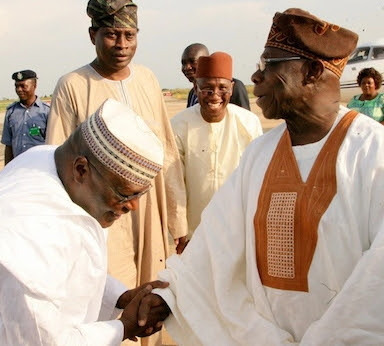 Meanwhile, there were indications that Northern leaders in the PDP are awaiting former President Olusegun Obasanjo’s verdict on Atiku before taking a position on the 2019 presidential ticket. Jonathan To Atiku On Presidential Ambition: Ignore Obasanjo At Your Own Peril! BUHARI,HILARIOUS INDEED BUT ACCEPT OUR SYMPATHY WHEN WE VOTE U OUT IN 2019.CALL YOUR BOYS TO ORDER WHEN THE VICTORY GOES DOWN SOUTH. Atiku is just bn greedy!! Ashawo politician!!! Atiku shd not forget to make Fayose his running mate. I AM somewhat thrilled(is that the word? )that OBJ remains a political deity in the eyes of the PDP even after the former president had openly torn his membership card to the disgrace and dishonour of the party. And would I be disappointed if OBJ fails to endorse Atiku’s candidacy? WELL, WHETHER ATIKU OR BUHARI, MINE IS that I prefer to have all these old names flushed out of Nigeria’s politics. They are the ones that have kept Nigeria like this to date.